Many UNFCCC stakeholders see climate finance as one of the linchpins holding together the entire climate negotiation process, for several reasons. First, climate finance is key to closing gaps: delivering funds to implement mitigation and adaptation activities is required to ensure the highest possible efforts. For mitigation, this means keeping the planet on a pathway that limits global warming to 2°C or less; for adaptation, this means enabling climate-resilient development. Second, the provision of climate finance fulfils developed countries’ financial commitments to developing countries under UNFCCC obligations. Third, some stakeholders maintain that developed countries, which provide the means to implement climate change projects (finance, technology and capacity building) will determine developing countries’ level of commitment and buy-in to a new climate deal in 2015. This guide maps several finance issues on the agenda of the Conference of the Parties (COP) and the Conference of the Parties serving as the meeting of Parties to the Kyoto Protocol (CMP), by providing information on the state of negotiations on those issues, in order to endow negotiators and other relevant stakeholders with key information to participate actively in the negotiations in Lima. 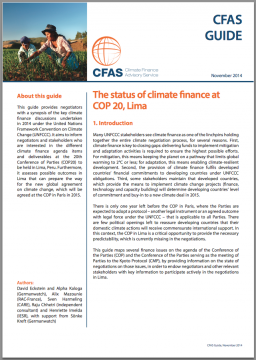 Progress on various aspects of climate finance will be needed in Lima in order to pave the way for the climate deal to be agreed in 2015 in Paris. These include new financial commitments until 2015, clarity on the pathway to the US$100 billion commitment by 2020, progress on accounting and reporting, and the finance architecture needed. The in-session high-level ministerial dialogue will hopefully break the deadlock on some of the issues that are affecting progress on other key climate negotiations, around mitigation targets in particular. The initial resource mobilization process for the GCF has been successful so far this year. Developed countries have pledged a total amount of around US$ 9.6 bn to the GCF. This amount is, however, slightly below the conservatively expected amount of US$ 10 bn. It is expected that the remaining developed countries will make additional commitments, in order to reach this US$ 10 bn goal. Noteworthy will be the discussion around the report and the Second Review of the Adaptation Fund (AF). Several developing countries have raised concern on the financial situation of the Fund, which despite its ongoing good track record is facing serious financial constraints. The question at the centre of the discussion will be how to ensure the provision of sustainable, predictable and adequate financial resources, including the potential diversification of revenue streams of the AF and how the AF could meet its fundraising target of US$80 million by the end of 2014. The Biennial Assessment and overview of climate finance flows will be an important input and will serve as a reference point that will inform the climate finance negotiations. As aforementioned, the BA also contains specific recommendations for helping to improve and harmonize methodologies for reporting climate finance data both within the SCF and in cooperation with relevant stakeholders and institutions. Based on this, a COP decision on MRV of support that could become part of the 2015 agreement would be an important step. Last but not least, the COP needs to provide specific guidance to the SCF on how the Committee could improve and move forward a definition of climate finance under the Convention.